John’s Repair is the best auto repair shop on the I-70 corridor! Serving the Strasburg, CO area since 1994, we specialize in vehicle maintenance, front-end work, tires, air conditioning repair and maintenance, oil changes, mufflers, brakes and more. We offer free estimates and the best warranty in the business! Need an oil change in Strasburg, CO? Engine light on? Hearing a rumbling from your undercarriage? Whatever the problem with your vehicle is, John’s Repair has the remedy! We’re the most trusted auto shop in the area for a reason: we take pride in servicing vehicles of just about any make or model, no matter the problem. Customers continue to come back to us when they need routine service or unexpected repairs because they know they’re going to get value, reliability and a welcoming feeling each time they visit us. We’re here to deliver a quality service that’s truly unbeatable. 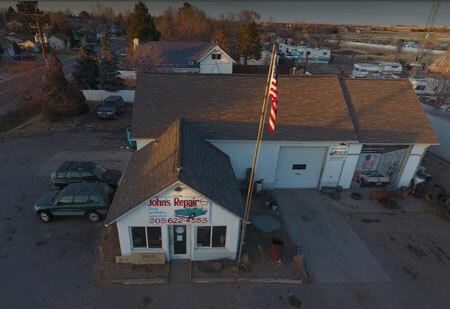 Our capabilities stretch the gamut of auto repair in Strasburg, CO—from your engine to your undercarriage, bumper to bumper. Best of all, our shop offers an unbeatable warranty! We warranty everything we work on, meaning we actually back up our work and our word. Moreover, if you’ve got parts that are still under warranty from a previous repair, we’ll make sure you’re getting that value—we can speak to distributors and manufacturers for you. Our mission is to be your auto repair shop for life, and we’ll do whatever it takes to make sure you’re one of our many satisfied customers. We’re the best repair shop on the I-70 corridor! We guarantee that we warranty, and we’re proud to have the best warranty in the business! Our business is proudly family-owned and –operated. We can work on all makes and models of vehicles, including diesels. We offer free estimates on work to all prospective customers. If your vehicle needs service or routine maintenance, roll on into John’s Repair! We’ll thoroughly inspect your vehicle and provide you with a free estimate on service and repairs. "I am overall very pleased with the worked performed at John's Repair every time I go in. Becca is very pleasant to speak with and John got t..."
"Very friendly and service oriented repair shop that do whatever it takes to your trust. I would highly recommend John's Repair to everyone." "I have been bringing my Jeep into John's Repair for years and have finally come to terms with a very difficult decision. Actually, it wasn't..."